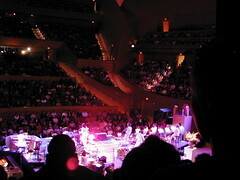 Bright Eyes deafened me at the Walt Disney Concert Hall. they were giving away free earplugs at the show and you were behind the sound system. perhaps attending a rock show isn’t the proper pastime for you. I’m curious to know what everyone else thought of the sound in Walt Disney. I had good seats, but I thought the sound was awful. I just don’t think the acoustics in that joint are maximized for the rock-n-roll sound. Gillian Welch sounded fantastic during her set when it was just her and her band mate on mic’d acoustic instruments, but with the full band in Bright Eyes’ set, the sound was muffled and overpowering (and not in a good way). The stripped down version of Lua with just Conor, Gillian and David(?) sounded excellent, though. having sat behind the stage, i cannot comment on how bad the sound system was for the rest of the auditorium. i was sorely disappointed that conor oberst’s lyrics were not easily discerned (and i’m not the only one; someone shouted out the same sentiment). my enjoyment of his music stems from the glorious melodies and his incisive lyrics. not hearing either due to an overly amp-ed set was a let-down for me. it sounds like gillian welch picked the right option with the mics. then again, her sound is more personal and depends on clarity more so than the rockers. and i loved the trio doing Lua too. it worked well. I’ve been confused by the “official” reviews of the show that I’ve read. All of them raved about the glorious sound of the Hall. These reviews left me wondering if these people were just determined to say that it sounded great or if it really did sound great from some vantage points. It certainly did NOT from mine. Thanks for the reply, bramble. Wondering now if we can get some input from someone who was a little more front-and-center. I was kind of on the wings. My guess at the time was that with Conor acknowledging that it was an odd place for them to be playing and adding that he “hopes it sounds alright” (to limited applause in response, mind you), there must have been some concerns raised at sound check. These suspicions would seem even more valid if they were indeed passing out ear plugs at the door. A rare move. They may have been, but I unfortunately was not offered any when I got there. It was still a great performance. Fully enjoyed it. Just a little disappointed with the sound. i’ve been to the WDCH quite a few times this past season and have found no faults with the acoustics for LA Phil performances. it seems a curious decision to play at the WDCH, but they may have chosen it for capacity(? ).